When you need orthodontic treatment, you’re looking at putting your dental future in the hands of someone else. It almost goes without saying that you need to be able to trust this person to create an orthodontic treatment plan with your best interests in mind. At Rogers & Andrews Orthodontics, we understand what’s on the line for you or your loved one and make it our highest priority to give you world-class care. How do you know you’ve found a fantastic orthodontist? 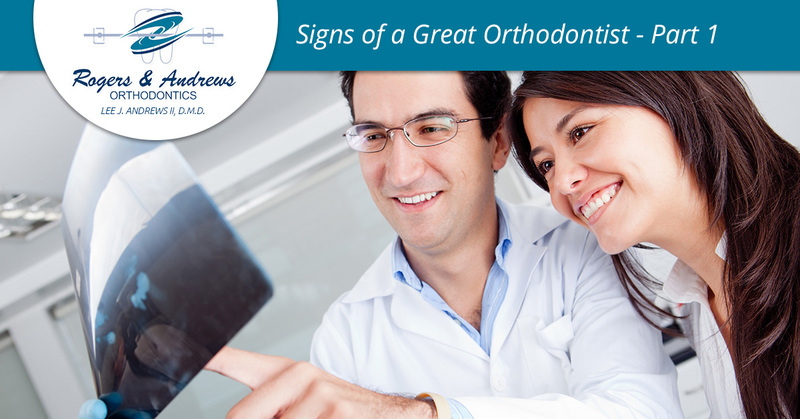 In today’s blog, we’re going to go over a few of the signs that you’ll see when talking with an orthodontist you can trust. These are characteristics that we strive for every day! Did you know it is possible to have good people skills but not listen well? In fact, good listeners are rare indeed. When it comes to your orthodontist, you need someone who will truly listen to what you’re saying. Otherwise, you may find yourself steamrolled and headed down a treatment path you don’t want. A great orthodontist won’t depend simply on their perceptions of your issue, they will listen to what you have to say and base the success of their treatment not only on resolution of your problem but how you feel about it. This one can be difficult to determine sometimes. Every orthodontist wants to be perceived as trustworthy because they know it’s one of the best ways to get your business. However, trustworthiness cannot be optional. You’re likely going to be sharing some pretty confidential health information. Additionally, you need to be able to trust that the orthodontist will make recommendations based on what you need, not how much money the orthodontist wants to makes. Check reviews and talk with friends who have used the orthodontist to get some insight into the trustworthiness of an orthodontist. It isn’t enough for an orthodontist to have a good set of credentials. Instead, you should be able to tell the orthodontist hasn’t stopped training. Great specialists absolutely love their work and will not just be competent, they’ll be on the cutting-edge of their industry. They will understand that increasing their knowledge increases their customer base and ability to serve their patients. If an orthodontist seems behind the times, you might want to look for someone else. If you have an arrogant specialist taking care of you, the results are probably not going to be good. The entire orthodontics staff should be ready to work hard and make you feel important. They should focus on you, not interrupt, and be as selfless as possible. Remember, it isn’t the lobby decor or fancy equipment that makes for a great ortho office; it’s the staff. Don’t settle for orthodontics teams who have their priorities backward; your dental health is at risk. Getting the most out of your orthodontic treatment is easier when you have a truly excellent specialist in your corner. At Rogers & Andrews Orthodontics, we work hard every day to be the answer that families need for their orthodontic needs. Contact us today!